Fossil hunting in Charmouth is a super day out! 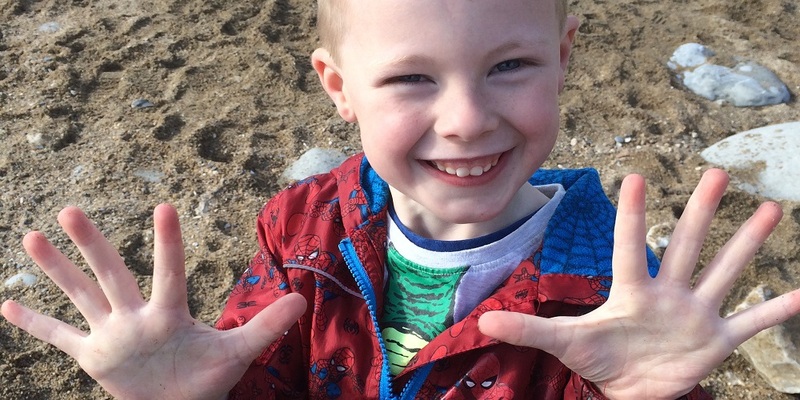 Both educational and enjoyable, my five year old son had loads of fun along the beach and during the fossil hunt. We had a beautiful day for our fossil hunt, and my son was really excited before we got there. I wasn’t sure how busy it would be so we arrived about 20 minutes early and parked with ease. There’s a choice of parking on the foreshore (£1 per hour or £4 for the day) or opposite on the seafront (£3 per day). The Charmouth Heritage Coast Centre, which is the meeting point for fossil hunting in Charmouth, is right on the promenade so you can’t miss it and everything is well sign posted. There are shops either side to explore too. We were greeted by staff as soon as we walked in. They had our names down on a list, so it all felt well organised, and we were given blue stickers each to wear to identify us. We were told where to wait for our guide. The centre is full of great activities for the children to keep them occupied while they wait, and my son and I were drawn to all the displays and chatted about what we might find on our hunt. Our guide’s name was Christina. She gave us an informative talk prior to going out to the beach, keeping it really fun and engaging the children with questions and funny anecdotes. My son was eager to answer the questions and was happy that he knew the answers. Her instructions were clear and we were told what fossils to look out for and showed us slides of what original sea creature they came from. After about 20 minutes, it was suggested we take a toilet break (the toilets were situated at the back of the centre and were well sign posted, clean and accessible) before meeting at the flag pole outside to continue on the next step. The toilets were situated at the back of the centre and were well sign posted, clean and accessible. I’d say there were about 50 adults and children on this walk along with around five guides, who we were all introduced to. Each was extremely cheerful and friendly. Once we were all on the beach the crowd seemed tiny in comparison to the vastness of the sand, rocks and sea. We eagerly dug in, after we had found our bounty spot on the beach. It was really nice to spend some quality one to one time with my son while we hunted for fossils. Every now and then you heard little squeals from other hunters as they excitedly found what we were all looking for. The guides were on hand throughout this time and we found them to be highly knowledgeable about our finds and the coastline in general. After the hunt came to an end and the group had shared their finds, we sauntered along the beach back to the centre and continued with some extra activities. We had brought snacks and drinks from home, which we had during the hunt, and there are plenty of sheltered places along the beach where you could stop for a picnic too. You may want baby wipes or tissues too, for mucky hands! The heritage centre has a cafe too, with seating inside for around 30 people as well as benches outside. The choice is relatively limited and they don’t take cards, but it was clean and the sausage, chips and tea we had after the hunt was fine. All in all fossil hunting in Charmouth was a super day, both from an educational perspective and in terms of enjoyment. My son had loads of fun along the beach and during the hunt and it was actually quite relaxing for me too! Fossil hunting in Charmouth covers some uneven ground, with sand, pebbles and boulders. It’s important that visitors are suitably dressed for the elements and wear footwear with good tread.